"We'd had to be cut free of our mother's womb. Abby and I were fused, you see. But here's the real kicker; Abby had the magic, I didn't." Now adults, Makeda and Abby still share their childhood home. The surgery to separate the two girls left Makeda with what feels like an even worse deformity: no mojo. The daughters of a celestial demigod and a human woman, Makeda and Abby were raised by their magical father. Today, Makeda has decided it's high time to move out and make her own life. Calamity is confronting two big transitions: the death of her beloved father and the beginning of menopause, a physical shift that has rekindled her gift for finding lost things. Suddenly, she is getting hot flashes that seem to forge objects out of thin air, most notably a four-year old boy. As Calamity takes the child into her care, she discovers that all is not as it seems. Then, Calamity must reawaken to the mysteries surrounding her own childhood and the early disappearance of her mother. It's Carnival time and the Caribbean-colonized planet of Toussaint is celebrating with music, dance, and pageantry. Masked "Midnight Robbers" waylay revelers with brandished weapons and spellbinding words. To young Tan-Tan, the Robber Queen is simply a favorite costume to wear at the festival - until her power-corrupted father commits an unforgiveable crime. Suddenly, both father and daughter are thrust into the brutal world of New Half-Way Tree. Here monstrous creatures from folklore are real, and the humans are violent outcasts in the wilds. Tan-Tan must reach into the heart of myth and become the Robber Queen herself. For only the Robber Queen's legendary powers can save her life...and set her free. 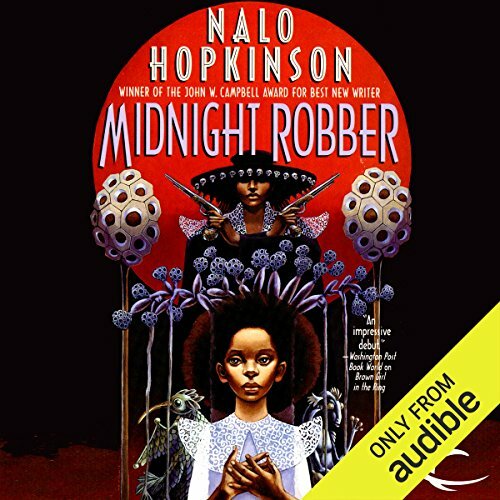 ©2000 Nalo Hopkinson (P)2012 Audible, Inc.
Robin Miles narrates Midnight Robber with a strong patois that was initially a turnoff for me. It was like listening to narration in a foreign language. The story itself is an unusual mix of old and sci-fi, there are 'aware' buildings with artificial intelligence the characters interact with and devices like toilets that measure one's physical health. There are also 'duels' with machetes and a lot of rank poverty. It reminds me of Firefly, with its combination of space ships and people riding horses. 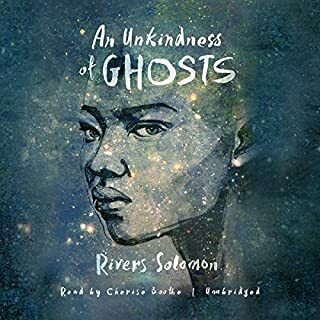 I believe the narrator's patois is of Haitian derivation, lots of 'oui's' and I definitely learned to love it. I found it musical and mesmerizing when all was said and done, DoDo. I listened to the novel at least three times and found things I missed in each subsequent listening. I grew to love Tan Tan, the main character in the novel. We meet Tan Tan when she is about 7, and lord, does this child have trials and tribulations to endure! In the end endure she does. I felt the story was also a reflection of the treatment of native, indigenous peoples. 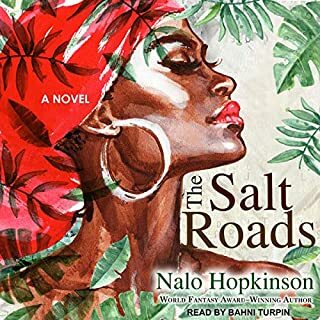 I find Nalo Hopkinson an engaging artist, introducing characters of locales of interest. I found the primary story line sad, however. Even into the future, across dimensions, girls are not safe. Despite that, I gave the novel top ratings across the board. 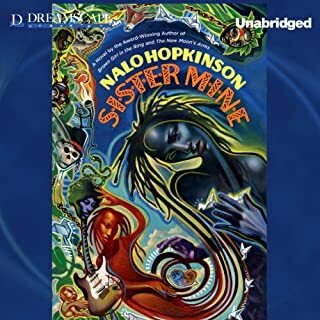 I will read Nalo Hopkinson again. I actually think there is a good possibility of a sequel to Midnight Robber. I want to know what happened to Iony, Melon Head, Chichibaud, Tifa and other characters it would be a spoiler to mention here. I recommend the book, it is very good and I'll probably listen to it a fourth time. That's one of the things I love about audio books, you can always invest in another reading! I listened during an eight hour drive. when I arrived at my destination, I stayed in the car listening another fifteen minutes. Do. Not. Miss. This Book. Big Bonus for writers: you'll learn as much or more about story, pacing, and craft listening to this book than by taking a novel writing course. 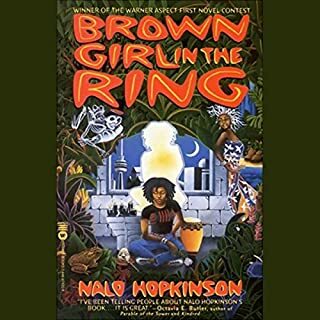 The story is Nalo Hopkinson's best. 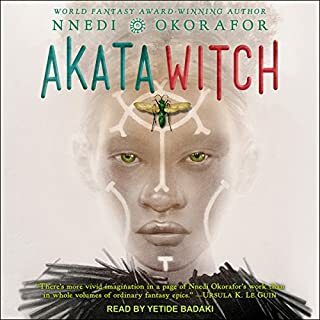 i like how it brings together all cultures of the Caribbean and its African roots, and its African-American antecedents, how it takes the story of yet another male folkloric figure and feminizes it, giving the woman voice, empowering her to rescue herself from invisibility and anonymity, and how it turns death into life renewed. I like the performance of the reader because it brings the characters alive, representing their uniqueness, and staying true to their Caribbean accents, languages, and culture. I would, however, have liked her to sing those little folkloric ditties so well-known to everyone who has grown up in a Caribbean space. You will probably either love or hate the narration style. But if you aren't immediately comfortable with it, I urge you to relax, be patient, and let it flow for a while. Robin Miles is a capable and versatile narrator, and this is some of her best work. Her rich, smooth voice really brings out the most of the island-style pidgin in which the characters speak, and she uses that accent for the exposition as well, fully immersing you in the sounds of the people of Toussaint and New Half-Way Tree. Before it was over, I found myself wanting to talk that way, because face it, it's kind of fun. compere: sir, or perhaps more equivalent to the Communist "comrade"
The story is also filled with references to real-life Afro-Caribbean legends and traditions, such as Mami Wata, Granny Nanny, Anansi, duppies, mako (or moko) jumbies, the rolling calf, and of course the titular Midnight Robber. Ignore them if you wish, but your enjoyment and understanding of the story will be enhanced and deepened if you take the time to look them up. I spent the whole story not understanding the mako jumbie reference (on New Half-Way Tree, it's a huge, long-legged, predatory bird, but there's more to its name than that), and I really wish I had looked it up early. I won't say much about the story except that it is a story of love, hate, exile (not once, but over and over and over), betrayal, hardship, discovery, and ultimately, redemption. It is a story of survival in difficult circumstances and coming of age. There are classic science fiction tropes like floating cars and AI, and there are highly fascinating aliens, but curiously, the twain never meet. Trigger warning: There is graphic sexual abuse. I found that it started slowly, but I really enjoyed the second half of the story. But I was slightly disappointed by the ending. I didn't think I could handle the subject matter, but I took a risk because Nalo Hopkinson. this book takes some trust. trust it, even though you might not fully understand for a while. you'll get there. it's taking you places, you just have to hold on. Has Midnight Robber turned you off from other books in this genre? The oration of the story was great but due to the above I was unable to commit to finishing the story. Where does Midnight Robber rank among all the audiobooks you’ve listened to so far? Midnight Robber ranks almost at the bottom of the books I've listened to. 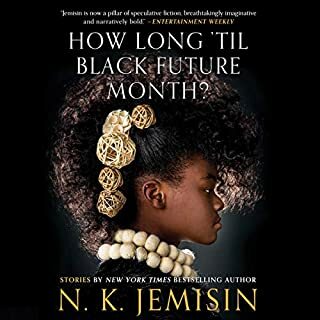 What could Nalo Hopkinson have done to make this a more enjoyable book for you? I think the author lied when she set up the father and the little girl as good characters in the beginning of the book. As the story went on, I found them both morally bankrupt and could not enjoy the story. The only reason I finished it was because I thought that Robin Miles' reading was sublime and I enjoyed the uniqueness of the patois. I wasn't sure about the accent at first but it was the best part, the whole story is amazing, very very good! This is a great book, really nice that it's partly patois. Such an enjoyable story overall (although there's a couple of horrible sexual violence bits). And the reading of it fitted perfectly. So deeply beautiful, The references. The light patois. The weaving of stories you heard as a child with references to places you've stood, the air you've breathed, memories long forgotten of generations past. I've never been in love with a book before. I've enjoyed stories, had moments of new learning and understanding from books but never love until now. Anansi meets Sci-fi! Very enjoyable listen. Would recommend it to any Anasi fan. Performance was fantastic! I loved the voice of this story, the linguistics and culture behind it. It's so rare to read sci-fi that is so unapologetically not based on a western perspective. The story was rich and riveting and often hard to endure for its heavy themes. But it is a story of survival, and it is stronger for it.